Church membership is growing in Papua New Guinea as more and more people embrace the gospel and embark on lives of service. When exploration of Papua New Guinea began in earnest in the 1800s, explorers may have thought that they had stumbled upon descendants of those who built the Tower of Babel. That’s because the Pacific islands comprising this nation, located north of Australia and just below the equator, are home to an estimated 850 languages﻿—nearly one-third of the world’s total. Papua New Guinea’s many languages can be attributed to a dramatic geography that has, until this century, isolated its predominantly tribal population. High mountains, rugged terrain, dense tropical rain forests, deep mountain valleys, and winding rivers all combine to create a diverse land and diverse peoples. Despite formidable barriers posed by geography and language, the Spirit is becoming a unifying force among numerous Papua New Guineans. The restored gospel is spreading throughout these isles of the sea, and people are beginning to heed the Lord’s latter-day call to hearken and listen together (see D&C 1:1). In what is called the “Land of the Unexpected,” Papua New Guinea Church pioneers expect the Church to blossom as word of the Restoration spreads and as dedication and commitment to Jesus Christ and his gospel increase. Slightly larger than California, Papua New Guinea has a population of four million people, about fifteen thousand of whom are Australian expatriates. This developing nation, rich in mineral reserves and forestry and fishing resources, comprises the eastern half of the island of New Guinea (the western half is Irian Jaya, part of Indonesia) and a thousand-mile chain of tropical islands that includes the northern Solomon Islands and the islands of the Bismarck Archipelago. Early Portuguese explorers dubbed their discovery “Island of the Papuas,” from the Malay word papuwah, or “fuzzy hairs”﻿—a reference to the dark, woolly hair of the island’s Melanesian inhabitants. The Dutch later called the island New Guinea because of its resemblance to the African nation of Guinea. When the nation was granted its independence in 1975, the two names were combined. Like the early explorers, the first Latter-day Saint missionaries visiting Papua New Guinea in the 1960s and 1970s often were met with suspicion. Misinformation about the Church abounds among the country’s largely Christian population, and opposition exists in some areas. But Papua New Guineans are friendly and generous. Church membership has doubled since 1987 to more than three thousand members, including many for whom curiosity paved the way for conversion. Such was the case with Nathan Siriga, second counselor in the Popondetta Branch presidency. As a provincial planner for the government in 1992, Brother Siriga decided to investigate unflattering rumors about the Church that were circulating in Popondetta, a small town located on the north coast. Brother Siriga took his questions to Benson Ariembo, who had been baptized in 1986 in Port Moresby, the nation’s capital and largest city. Brother Ariembo, second counselor in the Papua New Guinea Mission presidency, was then a fellow government official and leader of the Popondetta Branch. Brother Siriga admits that his interest in the Church wasn’t strictly official. President Ariembo gave Nathan copies of the Book of Mormon and the Doctrine and Covenants, which he studied for several months before deciding to be baptized. He spent the evening before his baptism praying about the truthfulness of the doctrines he had studied as an investigator. That night the Lord blessed him with a dream confirming the correctness of his decision. In his dream, “I was surrounded by people in white. They were praying for me, and they were overjoyed. I was in the middle of them, filled with joy, praying and crying at the same time. I felt like I was in the middle of the company of heaven.” He says the experience filled him with joy, strengthened his testimony, gave him spiritual insight, and left him grateful for the knowledge that his Heavenly Father is aware of him and his needs. The joy Brother Siriga felt that night and the next day at his baptism has stayed with him. Since then, he has worked hard to share his testimony of the gospel and to dispel rumors about the Church. A second major factor contributing to Church growth in Papua New Guinea is the influence of wantoks (literally, “one talks”)﻿—people from the same village, often family and friends, who speak the same language and share resources. Blood ties are strong, and familial obligations are taken seriously. Members of extended families usually live near one another. As a result, Papua New Guinea’s cities are often a collection of linguistic and cultural enclaves. Strong family ties, coupled with the transient lifestyle of many Papua New Guineans, have proved to be both a bane and a blessing to Church growth. While most branches have grown steadily in recent years, Sunday attendance fluctuates in the cities because members often travel to their home villages for extended visits. But the steady movement of people to and from the villages, coupled with the national pastime of sitting and talking, has helped spark gospel interest in areas where the Church has yet to establish branches. People in many villages are asking for missionaries, but thus far, the small force of full-time missionaries has been concentrated in “centers of strength” that the Church is developing in the more heavily populated areas. In these areas, members are being trained as they study gospel doctrine and serve in Church callings. Gospel interest in some villages, however, has been so great that village branches have been established. John Oii introduced his small ancestral village of Kuriva to the gospel in September 1986 when he returned from Port Moresby to bury his son, who had died from a snakebite. During a traditional two-month mourning period, Brother Oii shared stories of Joseph Smith and the angel Moroni. So many villagers were interested that Brother Oii requested missionaries to teach the eager listeners while he acted as interpreter. By March 1987, forty Kurivans had been baptized and a small branch had been organized. That same month, Elder James E. Faust of the Quorum of the Twelve Apostles dedicated a one-room, thatched-roof chapel that members had constructed out of local materials. Membership has more than quadrupled since 1987. With help from the seminary program, branch members have prepared fifteen young men for missions. Most of them have served in Papua New Guinea. Kuriva, about sixty-five kilometers northeast of Port Moresby, is located in what is called the bush. Four-wheel-drive vehicles or strong legs are needed to climb the rough uphill path leading to the branch chapel, located several kilometers from the paved highway. Concerns about visiting such an isolated area quickly vanish in wake of the warm welcome branch members extend to visitors. The chapel, which echoes with hymns on Sunday and on weekday afternoons during seminary, is nestled in a clearing surrounded by banana trees, dense foliage, and homes elevated on wood stilts to protect them from flooding. Robert Gandia, Kuriva branch clerk and a seminary teacher for six years, has taught seminary to many of those who later served as full-time missionaries from Kuriva. He says teaching the gospel and helping prepare missionaries has been a great blessing. Seminary is a highlight for members who live in the bush. Students eagerly answer gospel questions and keep up on their studies. Brother Gandia’s class of twenty-six students is often joined by adults interested in increasing their gospel knowledge; young women are happy to teach English or interpret lessons for their “older mothers” who do not speak English. Brother Gandia moved to Kuriva in 1989 after retiring from postal communications work. Like approximately 85 percent of his countrymen, he lives off the land. When he is not gardening, fishing, or hunting wild pigs and birds, he serves his brothers and sisters and teaches the gospel to his family and seminary students. Village life may be simple and modest, but gospel knowledge and Church service fill it with high purpose. Kuriva Branch president Jack Sevese, a returned missionary, says branch leaders emphasize service, example, and love﻿—Christlike attributes needed wherever children of God live together. Church growth in Papua New Guinea, as in other areas of the world, is a sifting. Some members endure, some do not. But thanks to increased strength in membership and leadership, many of those who have “backslided” are finding their way back. 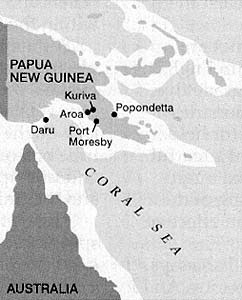 Responding to inquiries about the gospel in 1990, missionaries began proselyting on the small island of Daru, located west of Port Moresby in the Gulf of Papua. Three months later a branch was established with more than 150 members. Despite initial missionary success, activation dropped as the branch struggled with organization and as some members returned to their nearby mainland villages. Branch membership now exceeds three hundred, and activation has increased because branch leaders, with help from missionary couples, are reaching out and involving less-active members. The growing branch, which dedicated a chapel in February 1993, is drawing increasing interest from the nearby mainland. Most of the Latter-day Saints in Papua New Guinea live in Port Moresby, a sprawling city whose population of 170,000 includes people from many of the nation’s cultures and tribes. Other major cities, none larger than 85,000 people, are located on the northern coast. Travel between the northern and southern coasts is limited to flying, because no roads traverse New Guinea’s central Highlands mountains, with peaks that stretch nearly 15,000 feet in elevation. In addition to branches that are in and around Port Moresby and on Daru, the Church has established branches in several larger towns on the north coast of New Guinea, in Rabaul on the island of New Britain, and in a few villages, including Kuriva and neighboring Aroa, located on a coconut plantation. Missionaries have not yet reached the populous and fertile Highlands valleys, home to one-third of Papua New Guinea’s population. But Highlanders, who had little contact with the outside world before the 1930s, are beginning to ask for missionaries. Unlike those in larger cities, many who live in these smaller towns or villages do not speak English, which is taught in public schools. Villagers communicate with outsiders by speaking Pidgin English (a trade language derived primarily from English, German, and the languages of New Britain), Motu (used widely in the Port Moresby area), or one of several other popular languages. During lessons or talks, Church members often drift from English to their mother tongue. Because of language barriers, members frequently accompany the full-time missionaries﻿—even those from Papua New Guinea﻿—on teaching visits. Most Papua New Guineans speak several languages, but many do not read or write. About half the children begin elementary school, but only 15 percent attend high school. Nevertheless, an increasing number of young people are making their way to the nation’s two universities and to the small colleges found in most of the provinces. Latter-day Saints enjoy the opportunity Church membership gives them to enhance their education as they serve and teach one another. Members are especially thankful for programs like the Gospel Literacy Effort, which helps them develop reading and writing skills. The first books Doreen Huena wanted to read after she and her husband, Popondetta Branch President Winceslas Huena, joined the Church in 1990 were the Book of Mormon and the Bible. With her baptism, she says, came a spiritual peace and a strong desire to study the scriptures for herself. Following the death of her father and elder sister, Sister Huena dropped out of school at age nine to oversee the care of her eight siblings while her mother scratched a living out of the soil. A decade later, Sister Huena turned to the scriptures for texts and to the Lord for help. Through prayer, persistence, and help from the missionaries, she soon realized her desires to read and understand the Lord’s words. Her favorite verses are Doctrine and Covenants 130:18–19 [D&C 130:18–19], in which she learned that the intelligence gained in this life will rise with us and work to our advantage in the resurrection. Prompted by the Spirit and by many dreams about the truthfulness of the Church, Edna was baptized in 1990. Shortly thereafter, she was called to teach the Book of Mormon to seminary students. Branch members and the full-time missionaries encouraged Sister Amburo to ask the Lord for help. She took the suggestion seriously and spent a tearful two weeks fasting and praying that the Lord might strengthen her testimony and understanding of the Book of Mormon and help her to become an effective teacher. Sister Amburo attributes her spiritual and intellectual growth to help from her Heavenly Father. In addition to teaching seminary, she teaches Sunday School and serves as a counselor in the Popondetta Branch Relief Society presidency. Ken and Diana Winter, who coordinate and oversee seminary, institute, and literacy instruction for the Church Educational System in the Port Moresby area, say they are amazed by the dedication of their students and by the general interest young Papua New Guineans have in spiritual things. The Winters, from Perth, Australia, teach classes in four Port Moresby high schools. “We feel we are planting a lot of seeds of gospel understanding,” Brother Winter says. In one school, only two of the eighty students who attend their class are members of the Church. The master in charge of religious instruction at another school has asked the Winters to teach students about the importance of chastity and morality. The lives of Latter-day Saint converts in Papua New Guinea provide a striking contrast to the primitive lifestyle of their forefathers and of some isolated islanders today. Bright countenances, Sunday attire, and gospel service counter centuries of intertribal feuding and paganism and attest to the gospel’s power of spiritual rebirth. Christian missionaries, who began arriving more than one hundred years ago, have helped prepare the people for the restored gospel. Most Papua New Guineans consider themselves Christian, but some beliefs and practices antithetical to the gospel persist within the tribal cultures and villages. For many people﻿—traditionally surrounded by hostile and suspicious neighbors who speak another language﻿—the concept of “love thy neighbor” is a novel one. Wantoks who watch out for each other in the village might have no qualms about stealing from a rival tribe or from a stranger in a city, where jobs are scarce and unemployment is high, and where tribal identity and the unity of village life has been lost. The restored gospel, however, is helping to build a spiritual cohesiveness among Church members in the cities and is strengthening existing bonds within villages. Brother Hui, baptized in 1992, calls himself an “ordinary man” who has found what his people need. He says the Lord has blessed him in many ways, especially in his branch calling. While the branch president was away in 1993 visiting his home village, Brother Hui assumed leadership responsibilities. A newcomer to Church procedures, he spent many hours on his knees asking for help and direction. He predicts increasingly rapid growth as diligence and testimony grow among Church membership in Papua New Guinea. President Rome has served in many Church callings since he and his wife, Mauveri, became some of the first converts in 1981. In 1984 they traveled to the New Zealand Temple to become the first couple from Papua New Guinea to be sealed, and in 1991 they led a group of 138 members to the Sydney Australia Temple. President Rome counts the blessings of the temple among the many that have come to him, his family, and his people over the past decade. Those blessings have prompted him to dedicate countless hours to building up the Church and to sharing the plan of salvation. Papua New Guinean Latter-day Saints are confident that the Church will progress despite the challenges of illiteracy, tradition, and occasional opposition. They are even optimistic that the barriers posed by their nation’s many languages will be overcome. 1944﻿—U.S. servicemen hold first LDS Church meetings at Milne Bay on the southern tip of the island of New Guinea. 1960s﻿—Australia expatriates are authorized to begin holding Church meetings and socials. 1967﻿—Missionaries begin visiting Port Moresby and Lae. 1975﻿—Papua New Guinea gains independence. Freedom of religion is included in its constitution. October 1979﻿—The Port Moresby Branch is organized. June 1980﻿—Church leaders authorize the commencement of missionary work in Papua New Guinea; the nation is transferred from the International Mission to the Australia Brisbane Mission. August 1980﻿—Dennis D. Flake, president of the Australia Brisbane Mission, assigns Elder L. Douglas Johnson and his wife, Sister Eva Johnson, to Port Moresby to begin proselyting. November 1980﻿—Brother Auda Dauri of Port Moresby becomes the first Papua New Guinean adult to be baptized. His baptism follows by one month the baptism of several children. May 1981﻿—The Church gains legal status. March 1983﻿—Elder Rex D. Pinegar of the Seventy and President Dennis D. Flake organize the first district in Port Moresby. April 1983﻿—Elder L. Tom Perry of the Quorum of the Twelve Apostles dedicates Papua New Guinea for the preaching of the gospel. December 1983﻿—Ground is dedicated for the first chapel in Port Moresby. 1983﻿—Elders George Mauhi and Robert Goisisi become the first Papua New Guinea nationals to be called on full-time missions. 1984﻿—Vaiba Rome and his wife, Mauveri, travel to the New Zealand Temple to become the first couple from Papua New Guinea to be sealed. September 1984﻿—The Gabutu chapel in Port Moresby is dedicated. March 1987﻿—Elder James E. Faust dedicates the Kuriva Branch chapel. July 1990﻿—Full-time missionaries begin proselyting on the island of Daru. 1991﻿—Port Moresby district president Vaiba Rome travels to the Sydney Australia Temple with a group of 138 Papua New Guineans. November 1991﻿—Elder Russell M. Nelson dedicates property for the Popondetta Branch chapel and oversees ground breaking. February 1992﻿—The Papua New Guinea Port Moresby Mission is created, with Joseph J. Grigg of La Canada, California, as president. July 1994﻿—John R. Gibson of Underwood, Queensland, in northern Australia, becomes the second Papua New Guinea Port Moresby Mission president. The joy the gospel brings to Latter-day Saints in Papua New Guinea is reflected in the faces of Popondetta Branch Relief Society president Mary Jill Hiari (above), Aroa Plantation Branch seminary teachers Ori Sou and Sioni Kuri (below, left to right), and Port Moresby Sunday School students (far left). Background: Stilted house in Popondetta. Despite formidable challenges, Church membership has grown steadily since Auda Dauri (below) became the first Papua New Guinean Latter-day Saint when he was baptized in 1980 in Port Moresby (above). Left: Seminary teacher Robert Gandia and his son Trevor await students at the Kuriva Branch chapel (inset left). Members like Doreen Huena of the Popondetta Branch (below) and Port Moresby Gerehu Branch seminary and literacy teacher Esther Kairi and students Varia Audie and Hou Hiovea (inset left, left to right) welcome opportunities to grow spiritually and intellectually. Left: Village of Hanuabada, Port Moresby. Port Moresby district president Vaiba Rome (center); his wife, Mauveri (third from right); mother, Magiba Kavera (third from left); and children are grateful for the familial cohesiveness the gospel has helped them develop.